"Prepare for cuteness overload!"  Oh boy. 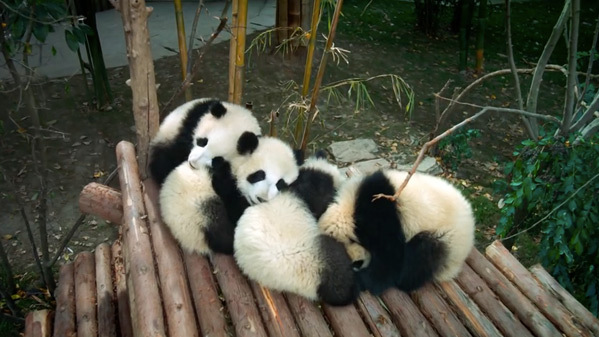 Warner Bros has debuted the first teaser trailer for a new nature documentary titled Pandas, that is simply about pandas in the wild. Filmed with IMAX cameras and being presented in IMAX and IMAX 3D, the film takes place mostly around Chengdu Panda Base in China. It follows a few researchers and documents the re-introduction of a panda into the wild. This is made by the filmmakers behind the other nature docs Born to be Wild and Island of Lemurs: Madagascar, and features a score composed by Mark Mothersbaugh (of Thor: Ragnarok). It looks like a harmless, fun, delightful animal documentary similar to the ones Disneynature has been putting out the past few years. I'm sure we'll see even more footage when the full trailer arrives, as this is just the teaser - but it's adorable anyway. Enjoy. At Chengdu Panda Base in China, scientists are dedicated to protecting the species by breeding adult Giant Pandas in order to introduce cubs into the wild. This film follows one such researcher, whose passion leads her to initiate a new technique inspired by a black bear program in rural New Hampshire. What starts as a cross-culture collaboration becomes a life-changing journey for an American biologist who crosses an ocean to join her; a scientist from Inner Mongolia; and a very curious female cub named Qian Qian, born in captivity. Captured with IMAX Cameras, join Qian Qian on an exciting new adventure in the mountains of Sichuan as she takes her first steps outside her protected habitat, discovering her true animal nature… even as she faces the challenges of the unknown. Pandas is directed by nature filmmakers David Douglas and Drew Fellman, of Born to be Wild and Island of Lemurs: Madagascar previously. Warner Bros will release Pandas in select IMAX and IMAX 3D theaters starting April 6th, 2018 this spring. Who's excited?